Individual investors can now easily track what top billionaires are doing with their money. 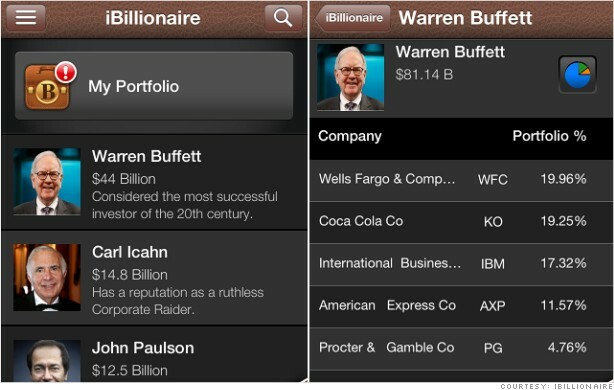 "Our users will be among the first to know" when these billionaires make changes to their portfolios, Moreno told CNNMoney. Click on any name and you get taken straight to their portfolio holdings. For example, clicking on Buffett brings you to a screen that lists his stock investments by name and ticker, along with how much of his portfolio is dedicated to each holding. You can also easily see what he paid for each holding and how it's fared since he bought it. And you can easily track how his portfolio stacks up against the broader market. iBillionaire also sends out individual alerts that show how a user's portfolio stacks up against those of the billionaires. The app is only available on Apple's (AAPL) iPhone for now but Moreno and Estrada say they're working on an Android version, which could debut as early as mid-May. Other enhancements, including 10 more billionaires, are due out by the end of April. Currently the app only tracks data back to 2009 but the next version will go back to 2002. There's a free preview of the app. The full version costs $4.99.